I opened Hanna Music Supply about 20 years ago. 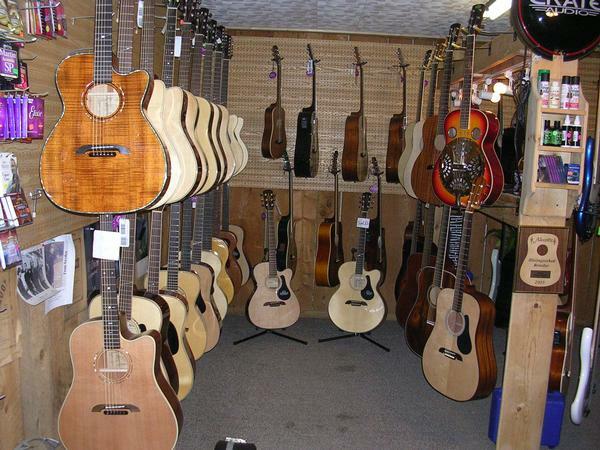 I started the store with my own collection with about ten guitars. Sold out the first week!!! Now I have Alvarez and Luna, Hagstrom, Gretsch,Peavey & Bedell,and I have about 90 new and some used guitars in my store. Stop in and check out the variety I have. Tuesday 10-5 & Friday 12-5, Wed. & Thurs 12-8, Sat. 10-3. I was born into a musical family, became a musician at an early age. Influenced by my father and rock bands throughout high school. Performed in many bands through the years, including The Pone Hill Band, The Wolf Crick Band, and Acoustic Fish. Frank Feroz Band, Max Schang, Hanna Williamson & Shick, Ransom, John Sferra, Blue Ash Alk Lax, Catro,E G Kight, I have opened for world-renowned acts including The New Riders of the Purple Sage, Lee Greenwood, The Charlie Daniels Band, Travis Tritt, Reba McIntire, Merle Haggard, George Jones, Phil Keaggy and many more. I have also headlined two tours through Sweden, Norway, and Denmark with a contemporary Christian band called Warcry. I started a "Coffee House" in the multi-purpose room at Barkeyville Church of God, the second Saturday of the month. Local musicians have been sharing there songs and it is working out well.